Common Council Matt Miklave (D-District A) uses a jar of pennies as a prop to illustrate his thoughts on Norwalk’s budgeting process last year at a council meeting. NORWALK, Conn. – The mayoral race is months away, but one Norwalk Democrat says he is already ahead in one key contest. “A scant six weeks into the new campaign season, the Miklave Exploratory Committee raised more than $4,600 from 20 contributors, while during the same period, former Town Clerk Andy Garfunkel reported raising slightly more than $1,000 from two contributors,” a press release from the Miklave Exploratory Committee stated. Common Councilman Matt Miklave (D-District A), serving his fourth term, formed an exploratory committee in mid-November to help him decide whether he would run for mayor in 2013. Garfunkel, who was defeated in his 2011 bid for mayor by Republican incumbent Richard Moccia, announced his intention to seek a rematch at about the same time. Miklave said his support is bipartisan. “There has been a groundswell of support from many quarters and from members of both parties. I am gratified that so many people are as invested as I am in making Norwalk a better city,” he said in the statement. Miklave has expressed his desire to focus on moving Norwalk in a more positive direction by building better budgets, stronger schools and a strategic plan for economic development that will bring jobs. “These three things are the building blocks for a city that serves its citizens,” he noted. Miklave was first elected to the Common Council in 2001, where he served as chairman of the planning committee and as council president. His current term on the council began in 2011. Great. Already a p—ing contest to see who can make the most campaign money? No, thank you. I don’t consider that transparency but more a taunt: we really don’t need to know how much money you have Mr. Miklave. Announcing this to the world seems disingenuous at best when what is required is a clear understanding of not just the issues everyone knows about but how you are going to lead when it comes to solving them. That would be a genuine campaign mission statement I would read and appreciate. WOW! Miklave’s campaign treasurer is Tony Ditrio, president of the School Administrators Union? We don’t need a Mayor who, if elected, will owe lots of favors to municipal employee union heads. That’s how cities wind up bankrupting themselves. We need a Mayor who will fight to get taxpayers the best value for every dollar spent. The other downside of Miklave as Mayor is that he will control the gavel and be free to bloviate as much as he wants during Council meetings, which will regularly run past midnight. Once again LWitherspoon proves his allegiance to Moccia and his failed administration..So sad that he is so brainwashed. Have some more of the Moccia the Moron kool-aid. Actually, this year the Democrats have three good men interested in the nomination. Lets hope one of them gets the nomination and the other two work hard to get him elected. A primary would be just what the other party wants. building better budgets, stronger schools and a strategic plan for economic development that will bring jobs. Sounds well and good, but fluffy. I’m all ears, Mr. Miklave, when you are ready to elaborate on the how, when and why and not just the what. Does “better budgets” = “zero based budgeting”? Does “stronger schools” = “results-based accountability”? Does “strategic economic development plan” = “no more empty holes”? Very perceptive. When you look past all the fluff emanating from Matt “The Bloviator” Miklave, you see that there is next to no substance. He is the worst kind of politician, promising all things to all people. The sort of guy who looks for an angry mob, installs himself at the head of it, and considers that “leadership”. Sometimes Miklave’s pandering contradicts his own on-the-record votes or positions. For example, during the debate over outsourcing trash pickup, Miklave criticized the new Fire Station as a “monstrosity”. Which is certainly his right, except that Miklave voted FOR the Council resolution authorizing the spending to build the station. Oops! During the debate over adding bike lanes to Beach Road, Miklave volunteered to PERSONALLY get some buckets of paint and re-stripe the road himself. He forgot that by doing so, he’d be taking work away from DPW Union employees, who he also claims to support. The third strike against Miklave is the fact that the head of the School Administrator’s Union is his campaign treasurer. We don’t need a Mayor who, if elected, is in debt to municipal employee union officers on day one of his Mayoralty. That’s the sort of political relationship which leads to the unaffordable salary and pension arrangements that bankrupt cities. Just a passing observation – The Norwalk Public School District has been using the RBI (Results Based Instruction) model for several years now. They have standardized the math curriculum in many of the schools. Literacy program is the upcoming change. The Core Curriculum will be implemented as required by law. All that is under the supervision of the Superintendent of Schools. Not the Mayor. Odd how you seem to think that every democrat is a “Bloviator” when the true ” Bloviator” is your buddy Moccia.. Tell us LWitherspoon has “Bloviator” and “gamesmanship” taken the place of “show proof” in your limited vocabulary as you seem to use these two words in each and every of your posts…BORING…. @NorwalkSpectator: thanks for that info, but perhaps I should have been clearer. I meant to imply results versus budgets. This article focuses on the fundraising totals of 2 candidates, that’s all. No explanation of why Mr. Miklave was holding up a jar of pennies. I guess it was obvious to those who were present when the photo was taken, but it’s not obvious to readers here. Further, I don’t see any info in the article that would help me decide which candidate to support. That’s not a criticism of the article, just an observation that the reader comments about one candidate being superior to another are not germane to this article. Miklave was using the pennies to represent dollars in the budget. 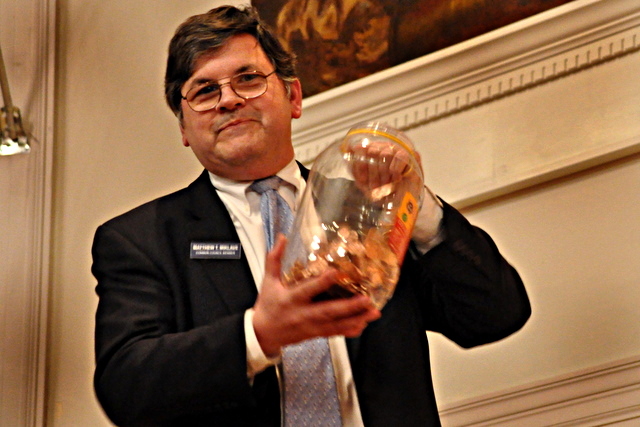 He transferred pennies to another jar to show how little of the budget was represented by savings obtained by closing the Norwalk Museum and by the garbage outsourcing proposal, which had been the source of much debate and attention. People should be looking at where the rest of the money was being spent, he said.